A hole in one every time. These golf themed business card holders offer a whole lot of style in one tidy package! The metal body features a matt nickel plated lid with a curved 'cut out' section in one corner to reveal the polished nickel plated bar with embossed golf ball motif. These sturdy cases keep up to 12 standard business cards in pristine condition. The lids can be engraved with a golf club logo, corporate or brand logo, or any other inscription you choose. 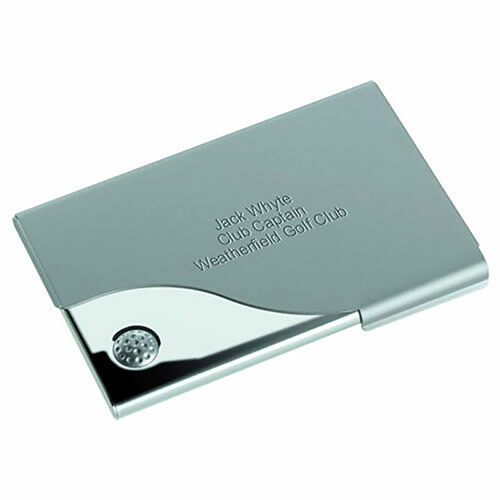 We offer free engraving so you can customise these stylish golf business card holders at no extra cost.